My cat taught me some lessons about myself and my dialysis experience so I’d like to pass that along. First, some history. I’ve never been a cat person but this one decided it needed to live with us and that was it. It was a kitten and I couldn’t say “no”. I wrote about it in my other blog, Legacy Tales, in “Sexing a Kitten 101” So here we are several years later and I still have the cat and my experience with “The Puss” as we refer to it continues, too. Until we moved into this new house, we never let the cat out of the house. Previously we had a large enclosed porch that he sat in for much of the day, looking through the screen that was between him and the outside world. I thought that was enough to satisfy him. He was safe and protected. I didn’t worry about him. 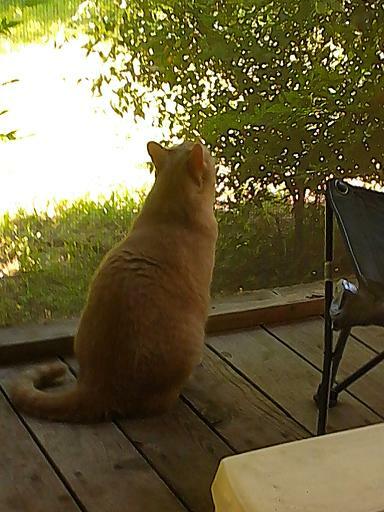 He just sat there watching all the activity in the back yard, the bugs, the birds, the squirrels, and my two dogs. For hours and hours he would watch from inside the screened porch. I thought I was being a good, responsible cat owner to never let him outside. When we moved into this new house, we didn’t have a porch. I considered building one but after all the other expenses, I just didn’t have it So for a couple months, The Puss had to be content to sit on the sill at an open window in the place of the large porch he enjoyed previously. However, as spring turned to summer — and in Texas summer is horrendous! — I couldn’t have the window open once the air conditioning turned on. So, Puss needed some outdoor time and I had to make a decision. With great trepidation, I let him out the back door and into the fenced back yard. I sat out there for about an hour as he cautiously explored the yard and he followed me into the house when we’d both had enough. But over the week, he went further and further from me until he finally went outside the confines of the fence and into the “dark jungle” of the world beyond. A few hours later he would turn up at either front or back door and I’d hear him “meow”. A couple times in the first month, he’d stay out until after dark. Sometimes, he’d return in late evening when he knew I was getting ready for bed. About the time I was getting worried, he’d show up at the door. Often, after a long day outside, he’d return looking like a frat boy after a festive Saturday night with leaves in his fur and burrs entangled in his soft belly fur. But he seemed really happy and pleased with himself. So, what’s my point? Well, it’s this. “Live your life! Take a chance!” We’re on dialysis and that means we have some limitations but like Puss, we don’t have to stay “indoors” all the time. We need to venture beyond our “fence” into the world beyond. Are you feeling like you’re stuck in “the house”, that you live a limited life enclosed by four walls? Is your life mostly consumed by just dialysis and little more? Then it’s time to consider going outside. I don’t mean get crazy about it. Take some cautious steps at first. Carefully explore as you venture out. But, get out. Stretch yourself and your limitations. Find some time for yourself that is outside the dialysis life. We are in dialysis only about 12 to 15 hours a week and a week has 168 hours! Allowing for sleep, that’s about 100 hours a week to live! I know what you’re doing in the 12-15 hours a week but what are you doing in that 100 hours? It’s Independence Day! Find your personal Independence Today! The Lesson: Live your life! Take a chance! This entry was posted in depression, dialysis, ESRD, Home dialysis, patient care, personal, pets, social networking, thoughts and tagged depression, dialysis, ESRD, hemodialysis, patient, patient care, Texas. Bookmark the permalink. Thanks for the analogy, Devon….the number or amount of time we have outside of dialysis…that’s a number worth noting more, I think! No prob. Glad to hear from you.